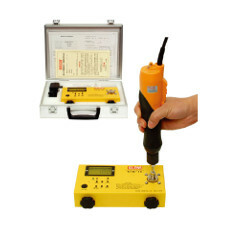 KTM-150 - a Japanese digital torque meter for torque wrenches - is in the offer. It is universal, only for clutch screwdrivers with shut-off function. Test range 0.15 Nm - 15 Nm. Option of transfering the screwing data through USB port. The user can set the torque range of the tested wrenches. The colour of LED indicator shows whether the tested wrench is complying with torque range setting, or not. Other torque meters in our offer are KTM-50 (test range 0.1 Nm - 5.0 Nm) and KTM-250 (0.3 Nm - 25 Nm).